It’s that time of year again when the kids are ready to get out of school, the evenings are longer so there’s more time to play, and parents just want to get the kids outside. While neighborhood parks are a great place to use up some energy and be with friends, a playground in the backyard is an even better option. The kids can go outside as they please leaving the parents to get some things done in the house or the backyard while they play. 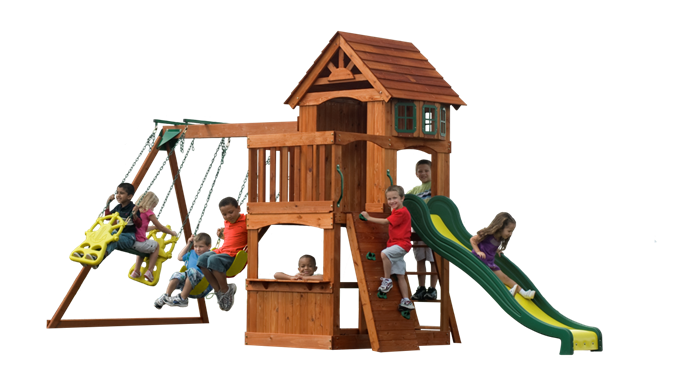 The Backyard Discovery Atlantis Cedar Wooden Swing Set is a great option for a background playground. It’s large enough to accommodate the kids and a few of their friends. It is loaded with features that will give kids of various ages and interests something to do. 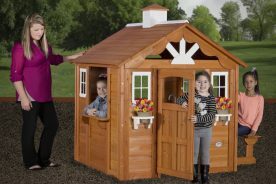 The all cedar wood, attractive colors, and numerous safety features make it a popular choice for parents as well. 1 What is included with the Backyard Discovery Atlantis Wooden Swing Set? 2 How big is the Atlantis? 3 Can I put the Atlantis Swing Set together myself? 5 Where can I purchase the Atlantis Cedar Wooden Swing Set? 6 Is the Atlantis Cedar Wooden Swing Set for me? What is included with the Backyard Discovery Atlantis Wooden Swing Set? When picking a wooden playset, or any swing set for that matter, it only makes sense to choose something that gives the most bang for the buck. Wooden sets are naturally going to be more expensive than a metal set due to the wood components in the structure. On a positive note, wood sets like the Backyard Discovery Atlantis also usually include a raised play deck and lower clubhouse. These additional components provide kids with more than just a place to swing and slide, but a place to explore and use their imaginations too. This swing set is built around a raised clubhouse and has everything kids of all ages would want. 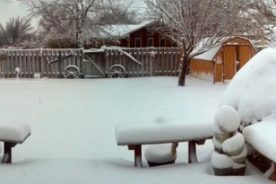 The covered play deck is situated 4 feet off the ground making it a good choice for families that have smaller children so they don’t have quite as high to climb as other 5’ high swing sets. The dimensions of the play deck are a spacious 64” x 40” and includes an outer sun porch that is not covered by the ship lap wood roof. A three-paned bay window gives the clubhouse a unique appearance and a great place to “look-out” for friends. Below the play deck is a semi-enclosed play area that includes a suitably named “imagination station”. This open window and counter can serve as a lunch counter, a lemonade stand, a stage for a puppet show, or whatever the kids’ little minds can imagine. Since the floor of the lower clubhouse is open to the ground it can also serve as a place for a sand box. The 7 cubic feet of sand required to fill the area is not included. There are two belt swings included with this wooden playset. 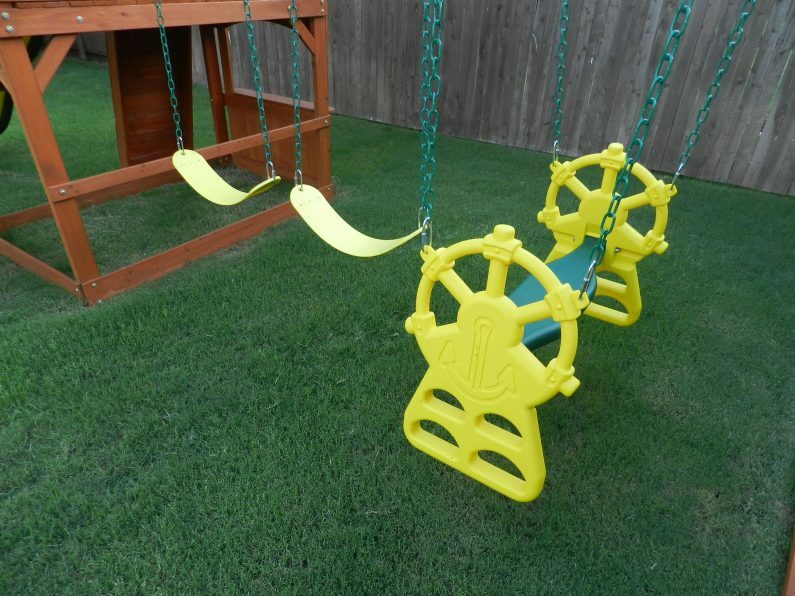 Both swings are a bright yellow color with kid-friendly chains. Each chain is covered with a green, plastic coating that keeps little fingers from getting pinched or caught in the chain links. The included quick links make it easy to attach the swings to the swing hangers and to raise or lower the chains as needed as the kids grow. The Ship’s Wheel glider is a unique accessory to Backyard Discovery. 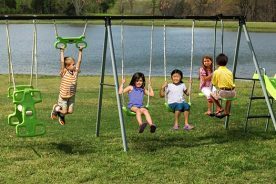 It is designed to allow two children to swing together and has multiple foot holes to accommodate kids of different heights. By pushing and pulling in sync on the handles that look just like a ship’s wheel, riders can really get to gliding through the air. The specially designed glider brackets move the chains away from the swing beam giving the glider a wider swinging range. At 8’ long the Speedy Slide adds another fun activity to the Atlantis. Its bright yellow and green color coordinates well with the other accessories. The slide is super-safe with its high sides and gentle slope at the bottom so kids do not fall off the end too quickly. While it does come in three pieces and require some assembly, unlike many slides that are one solid piece of plastic, the Speedy Slide is simple to put together and sturdy enough to hold kids up to 150 lbs. Not every swing set has something as challenging as the rock climbing wall. This set’s rock wall is a solid wall with six green climbing rocks. While the littlest children might struggle with reaching the rocks and maintaining balance while climbing, the older kids will enjoy challenging each other to see who can make it to the top more quickly. 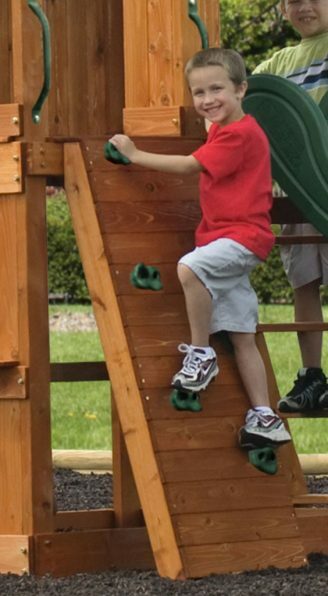 The two safety handles on either side of the opening at the top of the rock wall make accessing the play deck easy and safe. How big is the Atlantis? When assembled the Atlantis is 18 feet 1 inch long by 7 feet 9 ½ inches wide by 9 feet 3 ½ inches tall. It weighs approximately 300 lbs. 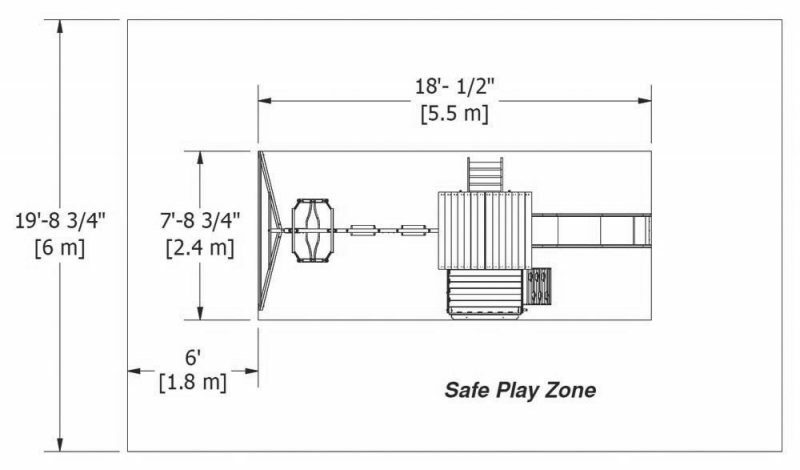 With the recommended clearance on all sides of the swing set for safety the play area should be about 30 feet 1 inch long by 25 feet 10 inches wide by 15 feet 3 ½ inches high. The swing set can safely hold up to 9 children. On multiple user items such as the glider swing, children should not be more than 120 pounds each. Children can weigh up to 150 pounds when using single user components such as the slide or belt swing. For shipping and transportation purposes the swing set components are packaged into two separate boxes. Box 1 is 90 ¼” long x 22” wide x 7 ¼” tall and weighs 144 pounds. Box 2 is 90 ¼” tall x 22” wide x 7 ½” tall and weighs 167 pounds. Can I put the Atlantis Swing Set together myself? 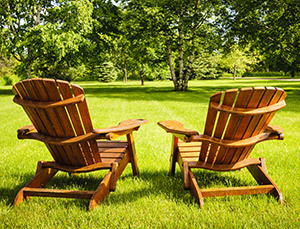 This swing set, like most other wooden swing sets, is designed to be ready to assemble. It comes with a detailed instruction manual that first lists all of the parts that should be included as well as the tools needed to complete construction. For convenience the lumber all comes pre-stained, pre-cut, and pre-drilled. In order to easily locate the correct pieces all of the lumber is also stamped with a part number. consuming task for some backyards it reduces the chance for the swing set to tip over and be a safety concern while the kids are playing. If level and constructed correctly this swing set will be extremely sturdy and last through many years of play. A copy of the instruction manual is included for constructing the play set. One notable detail about the instruction manual is that each step first gives a description of what parts and hardware will be needed to complete that portion. This gives the builder the opportunity to locate all of the pieces they’ll need before beginning the assembly process for that step. The instructions can be a little bit intimidating because every single piece of the playset needs to be fit together much like jig saw puzzle. It does not help that the instructions for this particular set did ave a couple of misprints and mislabeled parts in diagrams. The method used for labeling parts also changed part-way through requiring the user to go back to the parts list to compare and verify they were using the correct piece. Where can I purchase the Atlantis Cedar Wooden Swing Set? The Adventure Play Sets Atlantis Cedar Wooden Swing Set is available at several well-known retailers. None of these retailers actually carry the playset in the store but after ordering online it can be shipped directly to a residence or to the store for pick-up. Usually when choosing the ship to store option, customers can avoid shipping costs. Is the Atlantis Cedar Wooden Swing Set for me? If you are looking for a sturdy, wooden swing set that gives kids lots of play options and will look attractive in your backyard then this set is a great option. It is a small to mid-sized set that will require more space than many metal swing sets but will easily fit in most residential backyards. With the exception of a few mislabeled instructions, the set is ready to assemble with its fool-proof labeling system and detailed manual. It is also easy to contact the manufacturer and receive excellent service in case of missing parts or assembly questions. So make your kids the envy of the neighborhood or the most popular kids on the block and order your Adventure Play Sets Atlantis Cedar Wooden Swing Set today!